Sprouts Voice Remedy is designed to relieve Hoarseness in a safe, natural way. By reducing inflammation, getting rid of stubborn phlem and opening the nasal passage. 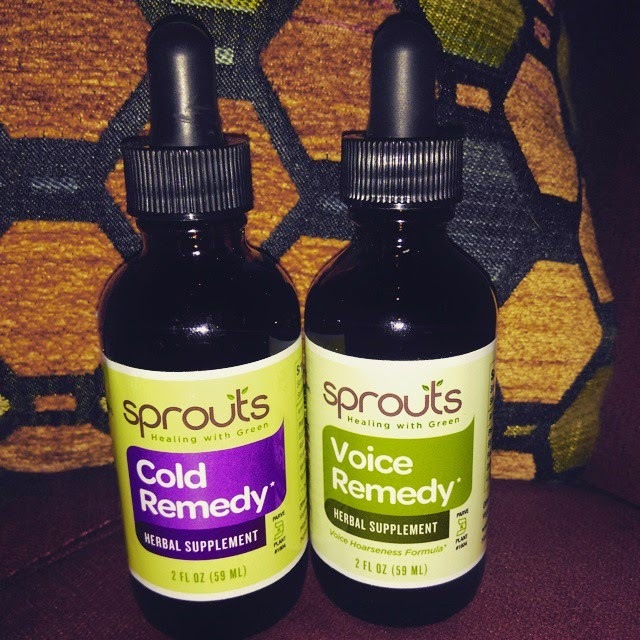 Sprouts Voice Remedy has been proven to produce a voice that is smooth and clear and helps you getting back the ring in your voice. I am getting over a bug that was going around, and I was very congested. It was so bad that I had to slather vapor rub under my nose just to be able to breathe! Around that time I got this in the mail and was able to immediately put it to use. This worked quite well at relieving me of my congestion. The sniffles went away within a day of use. The drops have a very herbal taste to them, I just mixed them with water and downed it. However you can mix it in with food if your tastes are sensitive. I have used another Sprouts product before, and they always remind me of the old time remedies that my grandparents used to tell me about. I love that I can look at the ingredients list in this, and actually see real items. Not some foreign chemical that I cannot pronounce. I actually look forward to the next time I have a cold so I can put this to the test and see how it helps from the start of a cold. For me personally it helped quite well and quickly with the congestion. This to me reminds me of old remedies that my Grandfather would put together when I was a child. I tend to be very hoarse in the morning when I wake up, plus I always tend to cough a lot. I have been using this daily for the past few days, and I have noticed some minor changes. What I appreciate and love about this, is the natural ingredients used. None of those chemicals that you cannot pronounce or have any idea of what they are. This includes basic herbs and such that many old timers used to use back in the day. The taste is very herbal, but nothing that you can't handle. I tend to just take the drops straight in water, and I'm good to go with 1 dose a day when I need it. So does this work? Yes. To me it works kinda like putting oil on a rusty piece of metal. It coats everything, and lets my vocals work like a well oiled machine. The biggest difference I have noticed is the lessening of my coughing. I cough probably a fair 50% less than before. I cannot tell you how much that alone helps ease my throat. If you are like me and like the old school, home remedy type of things, then this will be for you. I am giving this 4 stars because I have only had the chance to test this with hoarsness, the next time someone in my family or myself looses their voice I will reach for this and finish my overall review.